A weekly reflection on life and faith by Dr. Tom Cheatham, a Presbyterian Church (USA) minister. This Thanksgiving, I want to reflect on the contributions of some of the unsung heroes of American democracy, industry, and science. They’re not household names, but we owe them a debt of gratitude, for others more well-known have built on their foundation. We know of course about the contributions of Thomas Jefferson to the political, cultural, and scientific life of this nation. But are you aware of George Wythe, his mentor? Born in 1726 and living long enough to see the birth of a new nation, Wythe was probably the first great American law teacher. In his home in Williamsburg could be found not only Jefferson, but also John Marshall and Henry Clay. It was Wythe who in 1764 drew up a forceful objection to the oppressive Stamp Act. He signed the Declaration of Independence and was a member of the Constitutional Convention in 1787. We can imagine the influence of Wythe on Jefferson as the young man read law in his home in the 1760s. The conversations they must have had, the people to whom Wythe introduced Jefferson, the sharpening of Jefferson’s intellect all led to that day when Jefferson wrote the Declaration. They influenced him as an ambassador to France and in his presidency. We owe a great deal to Thomas Jefferson, but we must remember the one who taught that great man and know that we stand on his shoulders as well. We stand on the shoulders of those whose accomplishments have given us the tools and technological advances and advantages we take for granted day after day. People with names like Copernicus, Galileo, Newton, Edison, Curie, Pasteur, Einstein, Dyson, von Braun, Watson and Crick, Kelly Johnson, Chuck Yeager, John Glenn. We don’t know their names, but we need also to reach far, far back to the primeval person who first discovered how to make a fire anywhere or the one who first fashioned a stone tool or fitted a wheel to a cart or set down thoughts in cuneiform writing. It is true we have great minds living today, and the succession of wonders keeps coming at a breathtaking pace. At the beginning of this century, it was estimated that more information had been generated from 1970-2000 than in the past 5,000 years! One weekday edition of the New York Times contains more information than the average person encountered in his or her entire lifetime in seventeenth century England. But to paraphrase Ecclesiastes, is there anything really new? Are we not simply privileged to add rows to the ever-higher human pyramid? Would we have space travel without the work of Copernicus or Newton or the firm stand of Galileo against superstition and dogma? Or DNA testing or genetic engineering and therapy without the discoveries of Watson and Crick in the late ‘50s? We owe a tremendous debt to those who invented the computer or the MRI or the laser. Regarding the last, in 1917 Albert Einstein recognized the existence of stimulated emission of radiation from atoms. It took until the 1950s, though, to find ways to use such an emission in devices. The American physicists Charles H. Townes and A.L. Schawlow and two Soviet physicists first showed that it was possible to construct a device using light in wavelengths we can see. The first laser was constructed in 1960 by Theodore Maiman in this country and used a rod of ruby. These guys are, again, not exactly household names, but we owe them a debt. Think about it. Have you ever had laparoscopic surgery? I have, and I am grateful for lasers every time I think about my four little scars versus the big one my dad got when he had his gall bladder removed 30 years ago. Does your credit card have a hologram on it? Lasers again. Ever use a laser pointer in a presentation? Things we take for granted and enjoy are ours because we stand on the shoulders of those with the intellect, the resources, the imagination to conceive of them, develop them, and build them. We’ve got so much to be thankful for this holiday. At the top of our list, let there be those on whose shoulders we stand, who have made it possible for us to be and do what we are today. Please note: There will be no post next Friday. And no one puts new wine into old wineskins; otherwise, the wine will burst the skins, and the wine is lost, and so are the skins; but one puts new wine into fresh wineskins (Mark 2:22). After over a year without a pet, we got a new dog about 10 days ago. She’s a sweetie, an eight month-old rescue dog named “Chloe” that Susan found online. 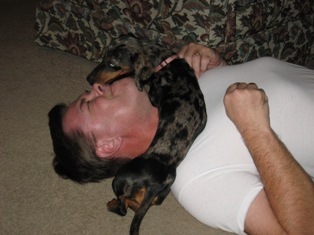 A miniature dachshund, of course, as were our two others. Chloe has her own personality, her own take on the typical dachshund traits that we love and are sometimes challenged by. And I know one of these days we will cease calling her by her predecessor’s name. But right now, about half the time, we talk about her as “Penny.” We’re still getting adjusted or we might say oriented to our new pet, as she is to us. Part of that orientation, too, is trying to find our pet-owner rhythm again. We’ve rarely been without a dog throughout our entire marriage, and we know that we will establish a routine. But right now, getting used to the new pup’s habits, taking her for first check-ups at the vet, figuring out what she will eat, and house training her feels disruptive, even though we’re glad to do it. Any change, whether joyful like having a new pet or not so great, like losing someone you love, brings stress and disorientation. Life is interrupted. We don’t know whether to zig or zag, how to fit in the new reality with our old patterns. Well, it may be that such cannot be done. The old patterns have to go. As Jesus said, no one puts new wine in old wineskins, because the skins will burst, and the wine will be lost. In other words, we can’t go back to our old lives. We can only go forward. Walter Brueggemann, the biblical scholar, comments in one of his books on the pattern one finds in many psalms: orientation-disorientation-reorientation. Life deals us a blow or brings a change which sends us reeling. Our old understanding is gone, and nothing has come yet to take its place. A loved one dies, and we have difficulty coming to terms with the loss. But then somehow—I prefer to believe by the grace of God—somehow we are reoriented, that is, we find a new direction, a new way of looking at the world. We can go on, changed, wounded maybe, but somehow more whole. Everything I need to know I learned from my dog. Or maybe it’s from being a dog owner. In October and November, I mark two significant events in my life. One is a birthday, still a welcome celebration though I am heading headlong toward 60. The other is an ordination anniversary, on Reformation Day; this year it’s number thirty-two. A relaxing vacation weekend gave me time and energy to reflect on what I’ve learned over these years. As you have come to expect in these pages, the lessons are simple ones. Maybe that’s a lesson in itself, since anyone who knew me back when will tell you there was little about me or my way of acting and speaking that was simple. I hope it’s the years and the experiences those have brought that have uncomplicated me a bit. So, here goes with #1: show up. How many of us live in the past or the future and are not really present for today? We may be physically present, but our minds and our hearts are light years away, dwelling on some regret or an as yet unfulfilled dream. So we miss what’s here for us in this moment, right now. Like the sunset I didn’t see because I was trying to figure out the icons on the remote for our heater in our vacation cabin. Every moment holds possibilities. Indeed, some scientists even tell us that every choice spins off a new universe. So we need to be present, show up fully and joyfully, in this moment, this day, this place if we are to take advantage of what our bountiful God wants to give us. #2: be alert. We spent a great deal of time on the back deck of our rented mountain cabin looking out over the valley below. No, watching would be a better word. We wanted to see whatever came our way, and knew that in that environment, we might well witness something extraordinary. Our vigilance was rewarded the last day, as we scanned the valley and the sky one more time before leaving. First we heard the distinctive cry. Then we saw them: two eagles, soaring on the wind! Incredible! To see eagles in the wild! We both said “Now we can leave. What can top that?” A marvelous experience, given because we simply had our eyes open and expected wonder to wander our way. Finally, #3: be prepared. We had already packed the binoculars when the eagles flew by. I ran out to the car and got a pair, in time to see the great birds. But why had I not simply kept the glasses nearby? If something wondrous and awesome may come our way at any moment, then doesn’t it make sense to be prepared with the education, the tools, the perspective to fully enter in without hesitation or having to scramble to get what we need, only to find the opportunity gone? Like pilots ready to mount the cockpit on the Klaxon’s blare, firefighters in the station house on call to battle a blaze, we too can be ready. The Coast Guard motto Semper Paratus (“always ready”) is also a good one for life. Show up. Be alert. Be prepared. May God give us grace so to live!